At first, we don’t know what we can’t do. 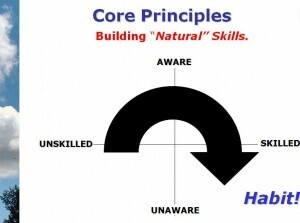 Then we become a “natural”, doing it without being aware of our skill. Here’s my revised Learning Model. I changed the words to remove the sting from the words Unconscious and Incompetent found in the original version. I had noticed that people frowned when I used those other words. I don’t think people learn when they’re frowning. Which led me to change other commonly used terms, like problem. When coaching, I spend a lot of time helping learners use positive action words (more effective synonyms) when describing situations and people. For example, stop using frustrating. Use fascinating instead. It softens the way we respond emotionally to situations. A ‘fascinating’ situation has room for resolution. Using challenge instead of problem implies there are solutions, not just bad feelings and pain. Challenge is motivating. Problem is discouraging, suggesting limitations. Watch the words you use when thinking or talking about your situations, use positive action words instead. Almost any negative word has a positive synonym; look it up in a thesaurus. Using positive synonyms drives positive thoughts for yourself and for others. Become an employee magnet by supervising with care. It takes only a few small changes to make a big difference in your workplace. Read Workplace Champion By Example for more simple ideas with big results to create an employee-friendly workplace.